MM: How did you get involved in the Breast Cancer Research Fund? EH: I was offered a job with Estée Lauder in early 1995, and right at that time, Evelyn Lauder came to me, and she said, “I just formed a foundation, and we’re going to raise money for breast cancer. Will you help?” That was 16 years ago, and since then, she’s raised a quarter billion dollars for breast cancer, and I’ve been helping her whenever I can. She’s the miracle worker, and I’m just her assistant. MM: I know you’re an entrepreneur now, and you’re starting an organic farm. Can you tell me a little about this? EH: Well, a few years ago I decided I had enough of city life, and so I moved deep into the west countryside of England, and I have my own farm. It’s a small farm of 400 acres, and I’ve turned it all organic. I have my own cows and sheep and pigs, and we have a little bit of arable, and I live there full time now, and I’m very, very involved and hands on with all of the farming. Right now, we’re in the lambing period, and I’ve been helping the shepherd lamb, and I have to say it’s been the most enchanting time. We had a spell of really bitter weather right when the first ewes were lambing, so we’ve ending up with 18 inside, which we’re bottle-feeding, which my son loves. At first, we were like, “Oh, it’s so sweet!” And the shepherd said, “Just wait, you’re now doing it for months.” So, literally for the last month, I’ve been doing nothing but bottle-feeding lambs and calves. We calved at the same time. It’s absolutely enchanting. It’s a very, very different life, but it’s kind of a gorgeous life, and it’s been a wonderful period. MM: You’re launching a line of organic bars. When are they launching? Can you tell us a little bit about them? 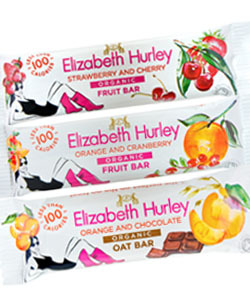 EH: I have a line of my own organic snack bars, and the whole point behind them is that they’re low calorie and low fat, all under 100 calories. 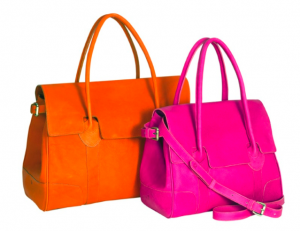 They’re not coming to America just yet; we’ve launched them in England about 4 months ago. We’re just moving them into Europe, and I’m really hoping by this time next year, I can be here and say we have them here. I think they’ll do very well here because people are very figure conscious, but we all understand that you need to snack from time to time. But Americans can still buy them from my website, they just won’t be in the stores just yet. I have to say during bikini season, I do try and tend to reach for a snack bar instead of a bag of chips—it helps. MM: And what are your three favorite beauty products? EH: I would have to say it’s always about a moisturizer for me. I switch and change it a lot, but right now Estée Lauder Re-Nutriv Lightweight Crème in the gold pot is my favorite. 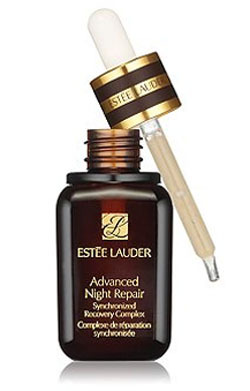 We also have a product called Advanced Night Repair, which is this gloopy stuff you put on under your moisturizer, which I’ve been using since the day I joined Estée Lauder 16 years ago, and I think it’s just phenomenal. 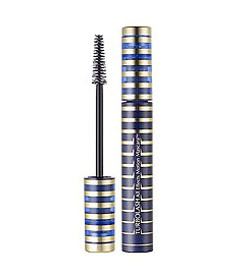 And then I guess I like a lot of black mascara, and we have this amazing one that wiggles when you put it on, and I absolutely adore that. It’s called TurboLash, which I love. Melissa Meyers interviews Elizabeth Hurley on the red carpet at the BCRF Gala. Watch the video. Then, hit the beach Elizabeth Hurley style in a bathing suit from her line. Shop Elizabeth Hurley Beach. Tell Melissa your bikini-season low-calorie snack secret. Tweet @PageDaily or post it on our Facebook fan page.